Sure, you can buy your own cheese at the grocery store, or visit Tillamook Creamery to get your favorite cheddar right from the source. But did you know you also can make cheese at home? Claudia Lucero has been teaching people how to do that for the past 10 years. The Portland entrepreneur holds regular cheese-making classes, has written a few cookbooks and sells cheese-making kits through her online store at Urban Cheesecraft and local and national retailers. She's not a cheese nut. She just believes in the power of DIY. "It's all about empowering people to look behind the curtain and take charge of our own food production," she says. "Especially things that are simple — that are lost skills, easy to reclaim." 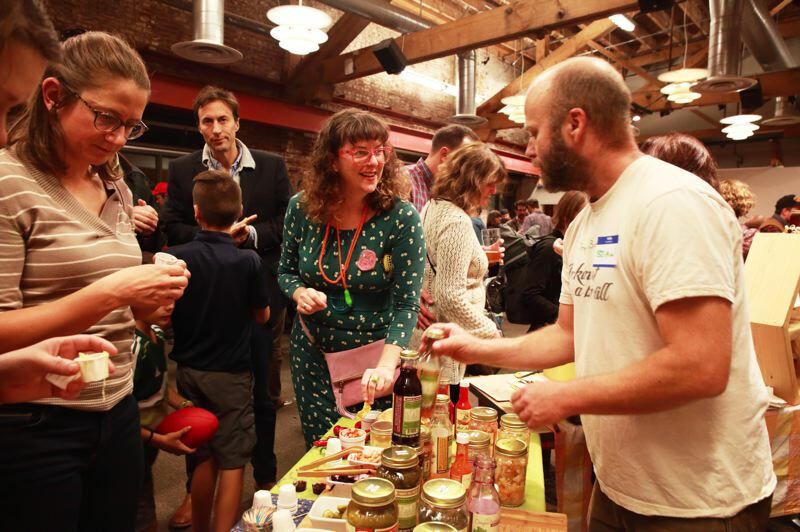 This year, Lucero is one of the co-organizers of the annual Portland Fermentation Festival, set for Thursday, Oct. 18, at the Ecotrust Building in the Pearl District. As always, it's a chance to learn about techniques, meet fellow fermenters, exchange cultures and recipes, get advice from local experts and enthusiasts, watch demonstrations, and sample everything from sour pickles and fermented hot sauces to miso, natto, cheeses, hard cider and kombucha. For the first time in the festival's nine years, this year's event also will include an on-site DIY component, which Lucero is organizing. At the Fermentation Station, attendees will get to assemble their own jar of sauerkraut of green and purple cabbage or a jar of veggies (donated by the People's Co-op) to take home and enjoy about a week later, after fermenting. "Last year I was part of (festival's) panel, and a lot of questions were, 'What is my first step?' If people who have those questions can leave that day with a little jar of sauerkraut they can continue to evolve on the countertop, how inspiring would that be?" While it might sound intimidating, Lucero says fermenting actually is simple once you get the hang of it. Part science, part art, making sauerkraut involves chopping up the cabbage and mixing in salt and spices to taste — anything from chipotle and paprika to cumin, dill and coriander. Once it's packed in a jar and allowed to sit, it forms a flavorful brine through fermentation. A quick ferment will have more of a chunkier texture, while a longer ferment will soften the crunch and bring milder flavors, especially with kimchi. All fermented foods have the benefit of natural probiotics, which aid in digestion and offer other health benefits. Like many, Lucero was first inspired by Sandor Katz, a Bay Area food activist whose 2003 book "Wild Fermentation" is said to have sparked the DIY fermentation movement. Lucero, along with followers worldwide, have used Katz's recipes as starting points for their own experimentation. Lucero also is a big fan of Southern Oregon-based fermenter Kirsten Shockey, who just released a new book called "Fiery Ferments: 70 Stimulating Recipes for Hot Sauces, Spicy Chutneys, Kimchis with Kick, and Other Blazing Fermented Condiments." In the fermentation world, experts are eager to share their knowledge. Shockey offers a free seven-day fermentation e-course, complete with shopping list, through her website, ferment.works. Lucero is offering her next cheese-making class at People's Food Co-op in Southeast Portland on Nov. 5, focusing on dairy-free cheesemaking, something she's been experimenting with. "Fermentation revolutionizes everything," she says. "What we like (in cheese) are the things created during fermentation, not the milk." Rather than milk as a base, Lucero uses everything from cashews and hazelnuts to pine nuts, brazil nuts, hemp seed and macadamia nuts. As the popularity of fermented food and drink has skyrocketed, the Fermentation Festival has drawn large crowds; last year's event drew 400 fans. • Ecotrust's Billy Frank Jr. Conference Center, 721 N.W. Ninth Ave.
• Food and drink for sale along with DJ music on the rooftop; an expert panel discussion of Japanese ferments; and demos and tastings. • All ages, open to the public, $10-$20 advance, $15-$25 cash at door, kids 12 and under are free.